Long story short: Modern youth hostel with trendy amenities and party crowd. I’m in a two-day long psychological battle with the charming teenager working at the coffee stand in the Wake Up! 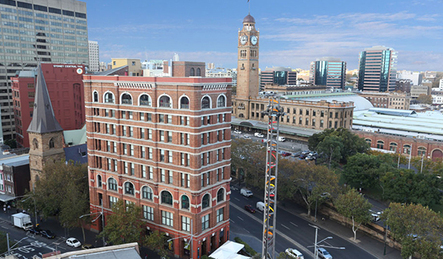 Sydney Central hostel. Me: Hi, I'd like a large skimmed latte to take away, please. Her: (keying it into on pad) Large latte...take away...skinny? Me: (thinks) I refuse to order coffee via the lexicon of size-shaming. I’m really in a psychological battle with myself and staying in a place I’m 20 years too old for. ‘Hostel’, let’s remind ourselves, is really shorthand for ‘Youth Hostel’, after all. Wake Up! Is one of Sydney’s largest hostels, and contrary to the image of such places in MY youth (mouldy old grief-holes with threadbare bunks and shared tea bags), it’s very much a minty, slicked-back, nightclub-you-can-sleep-in sort of a vibe. There. I’m even saying words like ‘vibe’. The building is a beautiful 19th century, 8-storey edifice, so at once it feels elegant, even if the hostel's slogan ("Wake Up! With Someone New!") feels like a Fresher's Week rallying call. At check-in, you’re given the low-down, including all the young people activities that go on each night – most of it including free food and drink, as well as beer pong competitions and people like DJ Goochclench playing late into the night in their basement bar. This excites the neon-t-shirted whippersnappers around me, who selfie and can’t even their way around the place with their looks and confidences and lack of concern about the impropriety of wearing sunglasses indoors. For them, Wake Up! is just an extension of their pan-global party, which is pretty much the way it should be if you’ve just left uni and are happy sleeping seven to a room. Me, I’m in the middle-age crisis suite, better known as a private bedroom. It’s a bunk, which adds an element of excitement and choice to the sleeping arrangements, and it’s a decent size, clean and close to the shared bathrooms (which themselves aren’t that prison-y, considering). You can stay here on basic terms, and buy cheap add-ons to enhance your stay: towels, internet, etc. The telly and voucher for a skinny (or otherwise) coffee, you get for free as well as the frattish activities and the genuinely helpful maps and pointers from the staff (indistinguishable from the guests apart from their uniforms – all side cuts and glowing complexions). I know that staying at places like this, you’re probably meant to beat someone up on your first day to assert dominance, but I managed to pass through the place pretty much unnoticed – the young are only interested in interacting with each other. They probably thought they might catch hairloss if they chatted to me. It was all way more polite then I thought it might be, though. Wake Up! keep it way more civilised than it might otherwise be by sensibly banning alcohol consumption from the rooms – so no all-night ragers (is that what they call them? I'm from the Vaudeville Age), meaning that even hateful dinosaurs like me can rest up without the neighbours spewing Andrew WK through the walls. Cheap, clean, central and – if hordes of self-confident and unbearably young travellers don’t intimidate you – fine to stay in even as an adult. PRO TIP: Check out is at 10am, but if you want to avoid the scrum that being young and lax and unconcerned about how much of your finite life is spent in queues creates, then checking out even at 9.15 or 9.30 means you can be sipping a skinny drink of your choice with a smug look on your face as the youths queue like the idiots we all once were. 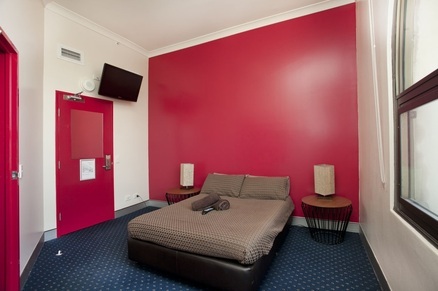 Champagne tastes: If you want complete privacy, splash out on your own room with en suite facilities for AUS$148 a night. Shandy Pockets: A dorm with nine of your mates will only set you back AUS$38 a night. Free coffee voucher, cheap cafe, free BBQ and drinking games, etc.